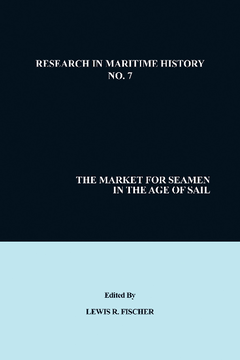 This volume collects eight essays that all attempt to answer two key concerns: did markets for seafarers exist in the age of sail; and, if so, were these markets efficient? The question was initially approach by Charles Kindleberger, who claims a market is efficient if it permits free access for employer and employee, is supply and demand match balance so that wages increase, and that labour must command the same price across the market. The first four focus on the broadly defined early-modern period, and all agree on the existence of the markets but are divided over whether or not they are efficient. The second section asks the same questions of the nineteenth century, and receives similar answers. All of the essays take issue with the definition and application of the term ‘efficiency’ when approaching their conclusions. Each author is considered an expert within their field, and all base their research on the North Atlantic. Section 1: These essays focus on the early-modern period of maritime history. Carla Rahn Phillips considers the market for maritime labour in early-modern Spain, finding that despite the necessity of sailors and existence of the market, wages remained low and skilled maritime labourers did not have bargaining power, rendering the system inefficient. Vince Walsh examines Salem, Massachusetts, and finds that the market within Salem was efficient yet would only recruit within Salem and suffered as a result. Paul van Royen focusses on seventeenth and eighteenth century Netherlands, and finds the organisations functioned well but enable huge discrepancies in wages. David Starkey chose eighteenth century England, noting a fluctuation between efficiency and inefficiency across markets. All authors find their work linked by the prevalence of these markets and their own difficulties in determining ‘efficiency’ within these economies. Section 2: These essays focus on the maritime history of the nineteenth century. David Williams discusses the emergence on the advance note and the tremendous influence it had on market behaviour, indicating inefficient markets. Yrjo Kaukiainen considers Finland’s history of interconnected local maritime labour markets, but also struggles to quantify their ‘efficiency’ after also taking issue with the ambiguous phrase. Lewis R. Fischer addresses the imbalance of wages in Norwegian maritime markets and finds that despite the integration from local to regional markets, the system remained inefficient. Finally, Morten Hahn-Pedersen and Poul Holm consider the fishing and shipping markets in Denmark and believe the wage inconsistencies reflect an inefficient system.